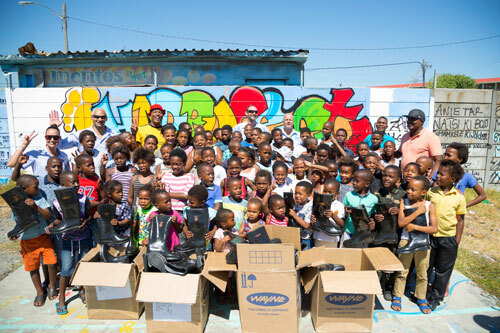 The Happy Feet Youth Project is a Cape Town-based non-governmental organisation that works with under-privileged children in one of the oldest and most over-crowded townships called Langa. The project was set-up to help keep children off the streets, away from criminal elements and expose them to brighter and better prospects outside the township. The project’s mission is powerful: To improve educational opportunities and encourage healthy lifestyles for its participating children. 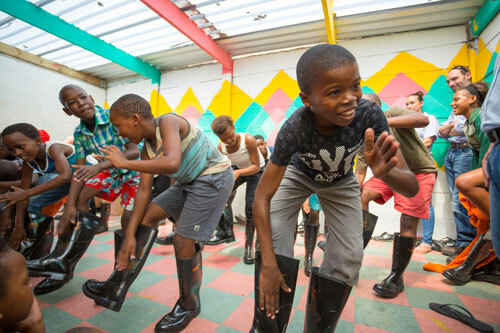 Values such as confidence, discipline, expression and respect are instilled through traditional children-led choreographed gumboot dancing. In addition, the project provides after school support in computers, technology and maths as well as a food programme to ensure they are receiving adequate nutrition. 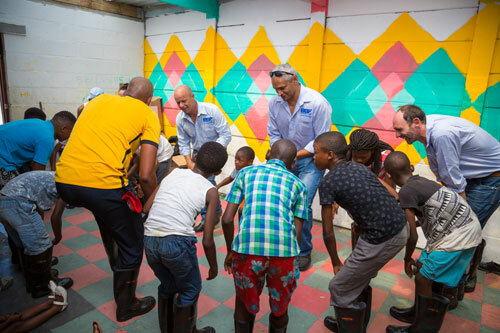 Wayne, a proud member of the BBF Safety Group, recently donated 48 pairs of gumboots to the Happy Feet Project. The donation will enable the project to grow its intake of young people from the township, thereby affording them the opportunity to experience the same sense of belonging, inspiration and happiness. “Our work would not be possible without the support of corporate sponsors such as BBF Safety Group. We are truly thrilled by the arrival of our new ‘music instruments’ and extend our sincere thanks to the people who made it possible,” says Siviwe Mbinda, Founder of The Happy Feet Youth Project. On the day of the handover, Wayne employees were fortunate enough to meet Siviwe and the children and attempted to learn some of the more ‘simple’ steps, steps which children can do with such apparent ease. “The dancing was a lot more difficult than it looks, but what a pleasure to meet Siviwe and the wonderful children at Happy Feet. It was eye opening to see how you can do so much with so little and how this project positively prepares them for a much bigger stage in life. It was an amazing experience that I was honoured to be part of,” commented Handre Botha, Sector Specialist, BBF Safety Group. Wayne is South Africa’s leading injection moulded PVC and PU gumboot manufacturer. With a wide product range that caters for a diversity of working environments, Wayne is committed to promoting social and economic equality in South Africa and will continue to support community projects that make a meaningful impact.